The OT3m is a standalone Tracker3 variant in a steel enclosure, similar to the OT2m that it replaced but with the addition of a USB port and a 10-pin terminal block in place of the OT2m's RJ12 accessory connector. The main Tracker3 page covers information relevant to all Tracker3 variants. This page contains only information specific to the OT3m model. 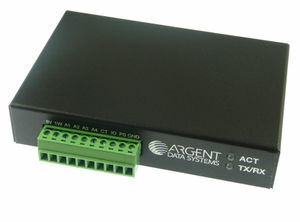 Note: The serial interface is configured as DTE (data terminal equipment) to allow direct connection to a GPS receiver. Connection to a PC requires a nullmodem cable. The analog inputs should not exceed 20 volts, and the digital input should not exceed 5.2 volts. The IO pin can be used to trigger the 'jumper' option in the profile switching dialog. Grounding the pin corresponds to the jumper 'on' setting, and 5v corresponds to 'off'. "sss" is the telemetry sequence number (incremented with each transmission), V is the supply voltage, A1-A4 are the corresponding analog inputs on the accessory connector, J is the status of the digital input marked IO, and C is the configuration profile in use. All analog values are given in tenths of a volt, e.g. 12.5 volts is shown as 125. The OT3m currently draws approximately 50 mA. 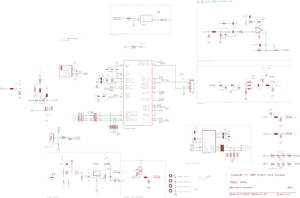 Future firmware revisions will reduce this as more power saving software functions are implemented. Starting with PCB version 1.1, the OT3m board has a 6-pin mini-DIN connector that allows connection of a standard PS/2 keyboard. Note that there is no opening in the enclosure for this connector. Presently keyboard input is interpreted the same as input from a serial terminal, so a keyboard can be used to enter commands and send messages without a PC. Keyboard support is currently considered to be an experimental feature. This page was last modified on 12 April 2016, at 09:22. This page has been accessed 39,579 times.